Established in 2002, American Bolero Dance Company’s Spanish Dance School is the premiere center in Queens, NY, and the only one of its kind to offer a variety of classes for children (ages 4 and up) and adults, with emphasis in Flamenco and Ballet. Gabriela Granados, Artistic Director and Founder of both, the company and its school, is the primary choreographer and head of the dance faculty. 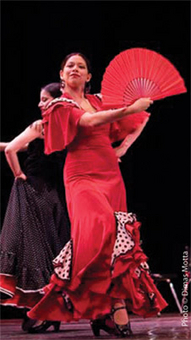 Our bi-lingual, professional teachers are trained in Ms. Granados’ dance method, a unique educational approach with a comprehensive syllabus that combines elements of Flamenco, Classical, Regional Folk and Character Dance. Performing opportunities are available to serious and dedicated students. Private and Semi-Private instruction available by arrangement. Click here to "Meet the Teachers"